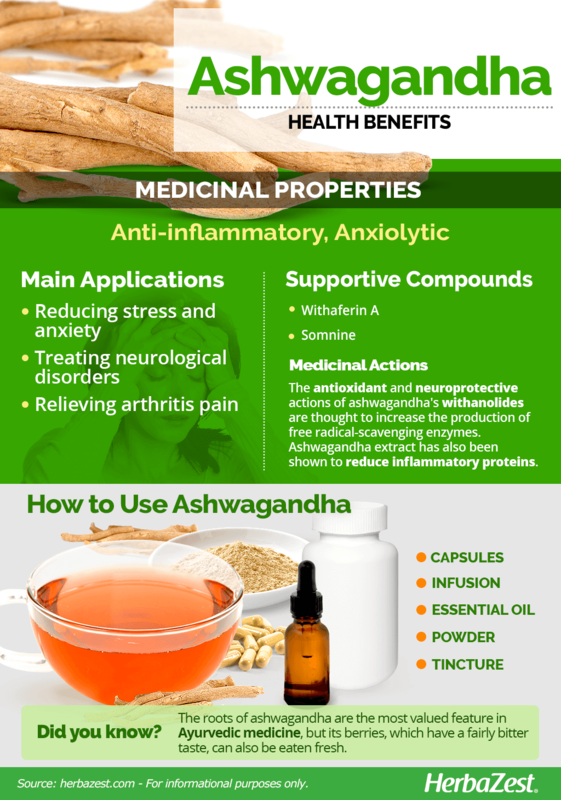 Ashwagandha is known as the "the herb that can support an army" thanks to its many vast array of medicinal benefits. It has been used in Ayurvedic medicine for millennia and is considered one of the most potent herbs in that traditional system. Rich in powerful health benefits, ashwagandha is revered among herbs. It has been used for centuries to treat a number of conditions, and it is believed to have restorative effects. In Sanskrit, ashwagandha literally means the smell of a horse, so named partially because of its pungent odor, and also due to its purported stallion-like ability to increase stamina and strengthen the immune system. Hailing from the dry regions of India, North Africa, and the Middle East, ashwagandha is an important herb in Ayurvedic medicine. It has been shown to greatly support the immune system and brain cells, as well as promote of overall health. Reducing stress and anxiety. It is known that ashwagandha can help reduce the stress caused by physical or psychological problems. Stimulating neurological function. It is possible for the plant to combat neurological disorders in some people, such as memory loss and involuntary movement. It has been administered to patients with early signs of Alzheimer's, Parkinson's, and Huntington's disease. Easing arthritis pain. It is widely accepted that ashwagandha works as a painkiller for those suffering from arthritis. Increasing energy levels. The plant is rich in iron, which makes it useful in providing energy for people with anemia. Enhanced libido. The anti-stress benefits of the plant have been shown to increase desire, enhance fertility, and treat sexual disorders in some people. Ashwagandha has proven to be one of the most powerful plants in Ayurvedic healing due to its wealth of active ingredients. Its main constituents are found in the roots; these include alkaloids and steroidal lactones. These compounds, such as withanolides - namely withaferin A - and somnine, play an important role in the plant's healing properties. The antioxidant and neuroprotective actions of ashawagandha's withanolides are thought to increase the production of free radical scavenging enzymes. Withanolides have been shown to activate several parts of the immune system, increasing white blood cell count, among other effects. Ashwagandha extract has also been shown to reduce inflammatory proteins. Other herbs with anti-inflammatory properties are cherry and cayenne, while lemon balm and St. John's Wort also help improve the symptoms of anxiety. Ashwaghanda is generally considered safe for short-term use; however, the safety of regular, long-term consumption is unknown due to its extensive pharmacological action. It is important to seek advice from a health practitioner before introducing supplements into one's regular diet. In some people, ashwaghanda has been known to cause digestive distress, such as vomiting or diarrhea, especially in large doses. Some cases have been reported of ashwagandha lowering blood sugar levels, so people with diabetes should be careful if taking it, especially if they're receiving insulin. Potential interactions include monoamine oxidase inhibitors (MAOIs, a category of antidepressants) and thyroid medication. The herb is also contraindicated for women who are pregnant or breastfeeding, as well as for people ailing with chronic autoimmune conditions. Ashwagandha is a flowering plant, and most of its components can be consumed. The roots are the most valued feature in Ayurvedic medicine, but the fruits - berries that resemble small orange tomatoes - are also widely enjoyed. The fruits can be eaten fresh, and the root is usually dried to make tea, or dried and ground for use in supplements. It is possible to eat the fruits of the ashwagandha plant, which are somewhat similar to goldenberries and cherry tomatoes in appearance, but they are fairly bitter and not to everyone's taste. They also do not boast the same quantity of medicinal properties as the roots do, and so they are not as popular in alternative health remedies. Infusion. The fresh or dried components of aswagandha can be steeped in hot water to obtain a medicinal infusion. This is a favored method of intake for those who want to reduce anxiety. Powder. This is most often made using ground, dried ashwagandha roots. It can be added to drinks as an easy method of intake. One popular preparation is to mix it with milk and honey before bed to encourage sleep. Tincture. The herb's components are crushed and macerated into a carrier substance (usually a neutral alcohol) to extract their benefits. A few drops should be diluted into water before drinking. Essential oil. Ashwagandha essential oil can be diluted and used topically or diluted and ingested. It can bring relief to pain caused by arthritis, and it also helps regulate hormonal imbalances. A few drops in a hot bath can also have a sedative effect. Capsules. This is a suitable option for those wanting to ingest ashwagandha but who do not enjoy the taste. Capsules are possibly the most popular mode of consuming this herb. The ashwagandha plant can be bought to maintain at home, and it is possible to harvest its fruit for consumption. Alternatively, the fruit can be bought from many supermarkets, grocery stores, and some farmers' markets. Many online retailers and specialized health stores stock dried ashwagandha in the form of tea leaves or ground root powder. Additionally, it is possible to prepare these at home if preferred. Because the plant is so esteemed in Ayurvedic medicine, the selection of supplements is extensive. Tincture, capsules, essential oil, and powdered preparations are some of the most popular forms; these can all be bought in specialized health stores as well as online. Research should be carried out before deciding which supplement is appropriate for the relevant condition. The ashwagandha plant is native to warm climates, originating in India and Africa. Even so, it is possible to successfully grow it in a range of conditions. Ashwagandha is widely available to buy as an established plant, or it can be cultivated from seed. Below, find some general advice with regards to the ideal environment for development. Ashwagandha plants should be positioned in full sun. Seeds should be sown near to the surface, as they need light to germinate. Seeds should be sown 18 – 24 inches (45 – 60 cm) apart. This plant requires only moderate irrigation. Sandy loam, well-drained soil of pH 7.5 – 8.0 is ideal. Ashwagandha is a fairly small shrub that does not often grow above 6.5 feet (2 m) in height. The stems are sturdy and thick, covered with short hairs, and from these stem large oval leaves develop. In between the leaves on the stem, clusters of fruit will grow. These consist of orange berries that are enclosed in a group of around five thin petals. The petals will begin bright green, but then as they dry, they become brown and split, revealing the fruit itself. Ashwagandha is scientifically known as Withania somnifera and belongs to Solanaceae family, which comprises about 90 genera and 3,000 species. This group includes crops of major agricultural importance, such as bell pepper (Capsicum annuum), chili pepper (Capsicum frutescens), eggplant (Solanum melongena), potato (Solanum tuberosum), and tomato (Lycopersicon esculentum). The only species in the genus Withania is W. somnifera. There are, however, different cultivars being grown commercially, mostly in India. For example, the Central Institute of Medicinal and Aromatic Plants, in Lucknow, has produced two high-yielding ashwagandha plants known as 'Poshita' and 'Rakshita'. In Madhya Pradesh, a cultivar known as 'Jawahar 20' has been developed, and it is valued because it is high in alkaloids and is suitable for high-density planting. Ashwagandha has been a staple in Ayurvedic medicine throughout its history. It is found mentioned in the texts of Punarvasu Atreya, a noted Indian medical scholar from around 2000 BCE. In Ayurvedic healing, the plant has long been thought of as a rasayana, meaning it has the potential to prolong lifespan. Its name comes from the Sanskrit word ashvagandha, which means horse (ashwa) smell (gandha), assigned due to the pungent scent the plant exudes. While demand for ashwagandha continues to grow, poor soil fertility in India and the cost of fertilizer and pesticides have proven the herb to be neither economical nor profitable, with dried roots and seeds having a market value of only $0.50 - 0.75 USD per pound. However, the herb is still used widely in Ayurvedic medicine, and India produces about 1,650 tons annually. Many people who observe Ayurveda believe that ashwagandha has almost boundless medicinal potential. As well as the aforementioned treatments, the root of the plant is believed to be beneficial for the development of children and for general strengthening in elderly people. Ayurveda teaches that optimum health can only occur when three bodily elements (doshas) are in balance; these are known as Vata, Pitta, and Kapha. It is said that consumption of ashwagandha can bring balance to a person's Vata energy. Gardening. Ashwagandha is mostly cultivated for its health benefits, but it is also appreciated as an ornamental. Because it produces beautiful flowers and colorful fruits, many people think of it as an aesthetically-pleasing addition to the garden. 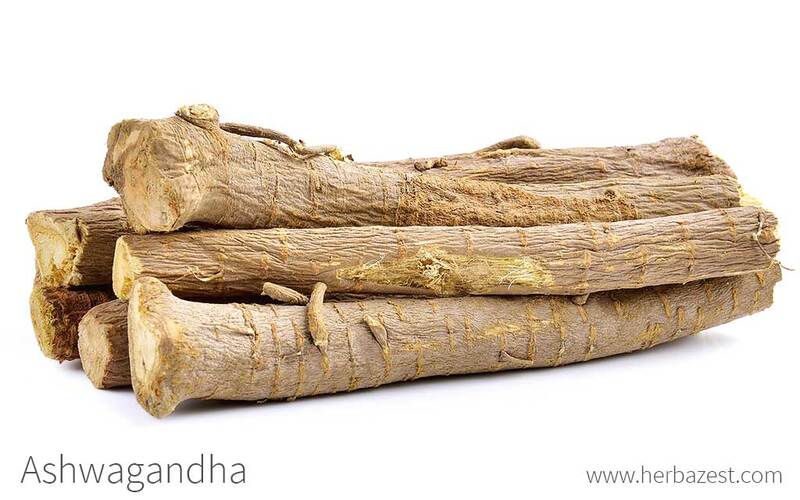 The medicinal features of ashwagandha are plentiful, so it is considered an important natural healer. It is generally not difficult to cultivate, but because it is the roots that possess the most properties, it is unfortunately necessary to harvest the entire plant, meaning new replacements must be grown all the time.